How about a Boat Friendly Pepper-based Paint Recipe? Chili Pepper Barnacle Repellant! 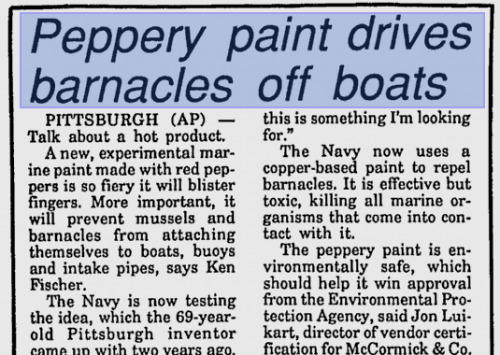 Thread: How about a Boat Friendly Pepper-based Paint Recipe? Chili Pepper Barnacle Repellant! In this article, they talk about a few uses for Chili Peppers. Take a look at the second story! Notice the inventor is from Pittsburgh! i wonder if it would work for the zebra and quagga mussles around here? i bet they could make a mint spraying outdrives if it did work.